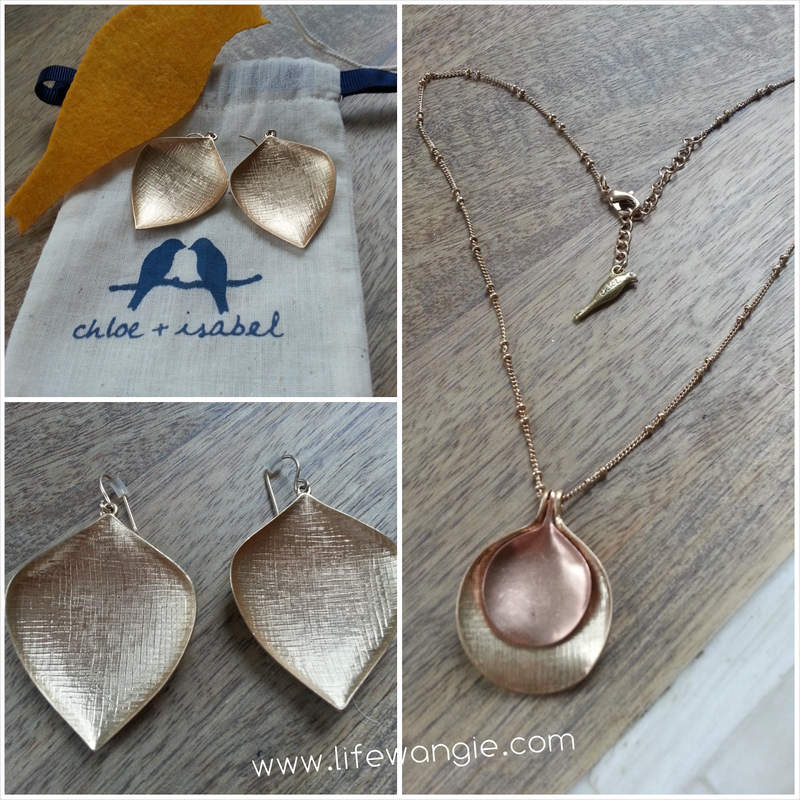 Life With Angie: Chloe + Isabel Review and Giveaway! 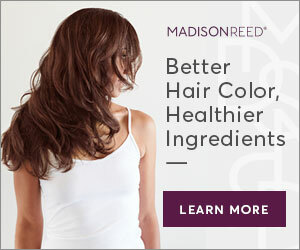 Chloe + Isabel Review and Giveaway! 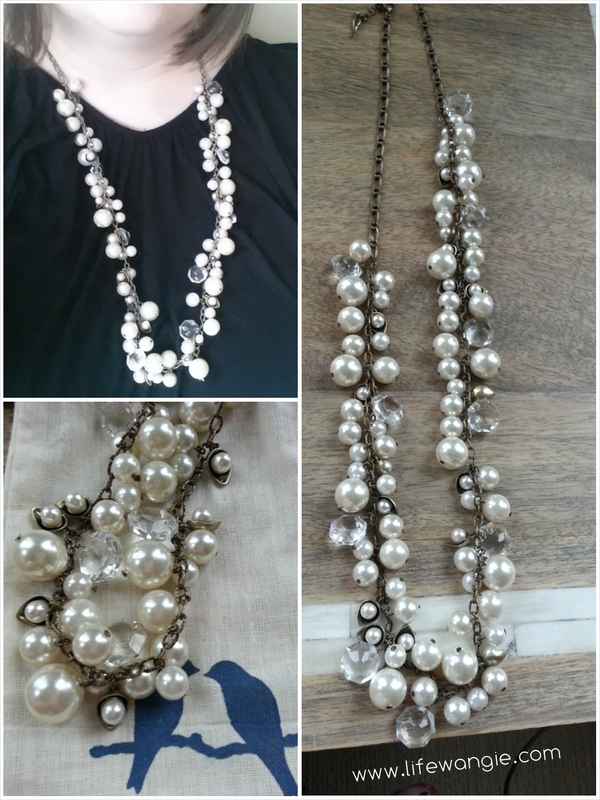 I've been hearing a lot of buzz about Chloe + Isabel jewelry lately, so when an opportunity came up to review some, I was excited! I worked with Wendy DiMilo, an independent Chloe + Isabel merchandiser for this post, and it's her link throughout. 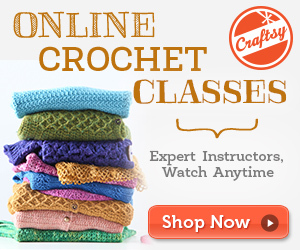 If you like what you see, you can order from her online. She sent me these pieces to review and provided the giveaway piece at the end of this post. So if you do decide to buy, let's give her some love! The detail in this piece is incredible. There are lots of little variations in the size of the pearls as well as the crystals, and some of the pearls are encased in lotus leaf shaped bits of bronzy metal. It's gorgeous and special and I don't have anything like it. Stretch bracelets can sometimes be a bit cheap, but this is really nice quality. All of the pieces came in their own little dust bags as well, which I love. The internet is kind of clogged with jewelry sites right now, and a lot of the stuff looks really pretty in the online photos, but then you get it and it is cheaply made. I've had stuff I was looking forward to and it arrived already falling apart in the shipping box. 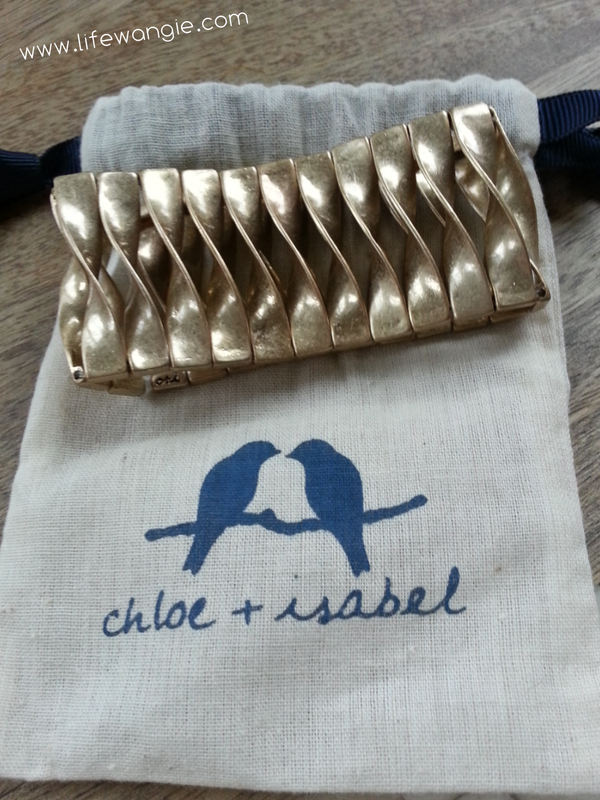 But Chloe + Isabel stuff is really the exception! Every piece I got was very well made and had special details. My favorite things were a necklace and a pair of earrings. These aren't necessarily a set, and they are sold separately, but they are paired together a lot in the catalog photos. I have been wearing them together. The necklace is the Sculpted Circle Pendant Necklace (style N043) and the earrings are the Textured Leaf Drop Earrings (style E106G). I love the texture and the organic shape of these pieces. And again, very good quality items. I have worn them as many times as I could, and I have decided they go with all of my work outfits. I work on a college campus and it would look weird for me to be too blinged out at work, so I love stuff like this that's not too ornamental but looks unique and special. I'm really in love with this jewelry. In fact, I was talking to Wendy and telling her how I get a few PR pieces from a company or seller sometimes and then it just makes me want more. 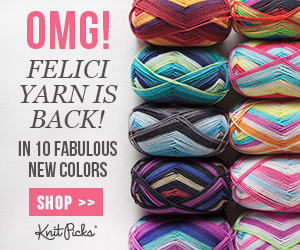 I am becoming my own best customer of this blog! I have to be really careful not to buy 10 more of everything I write about. But I definitely see some things on the site that I would love to have and/or that I would love to buy as gifts this year. Did you notice the clasp on the necklace? 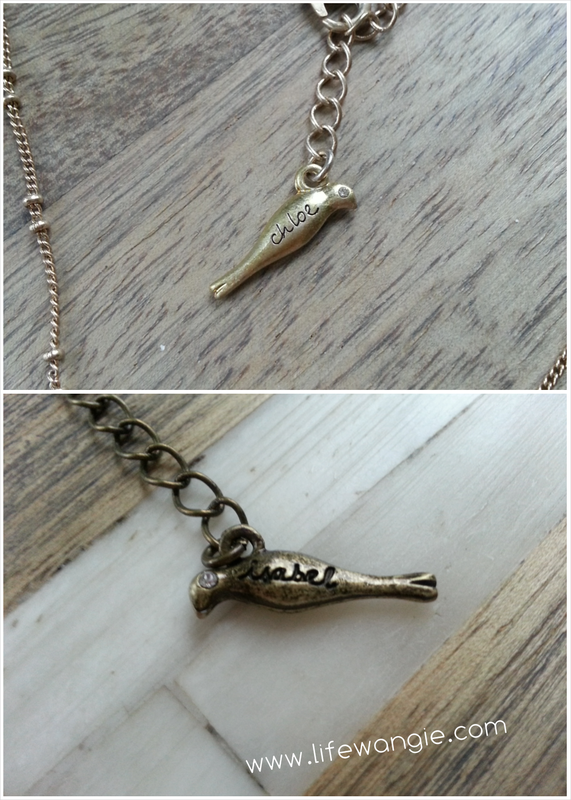 Both necklaces have this cute little detail of a birdie with the name Chloe or the name Isabel engraved in it. It's such a neat approach to that dangly bit of chain that is always hanging off of necklaces. I really feel special when I wear these pieces. I walk around all day just waiting for the compliments to roll in. Are you ready to get some compliments of your own? 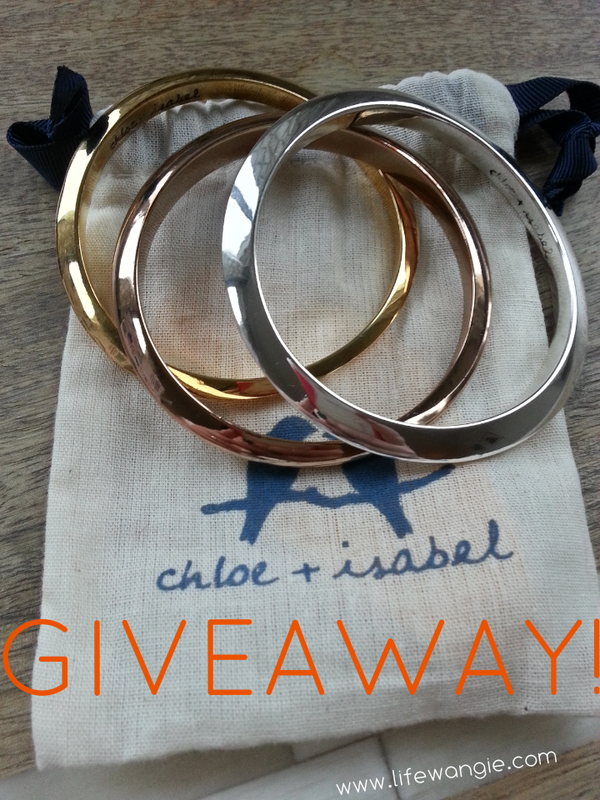 Wendy and I are pairing up to give away these gorgeous bangles! These are the Tri-Tone Bangle Set and they retail for $48! They are very nice, solid pieces. I will warn you that if you have ginormous hands like myself, they won't fit. But for anyone with average to small wrists, these would be a great score! All you need to do to win these is like the Life with Angie Facebook Page and then fill out this form with your shipping address. I will ship these via USPS from Seattle to the winner (US and Canada only, please!). The giveaway closes on March 10, 2014 at 9 PM Pacific, and I will announce the winner on Facebook the next morning! Yay for giveaways. 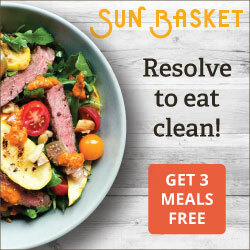 This contest is now closed! Thanks to all who participated. Note to self: Don't wear pearl necklace to polish meetups haha. Very pretty pieces...love the clasps! Oh I love pretties and bangles are my favoirite!